The NGMA Delhi has this retrospective. Would be great to visit if you are in Delhi. 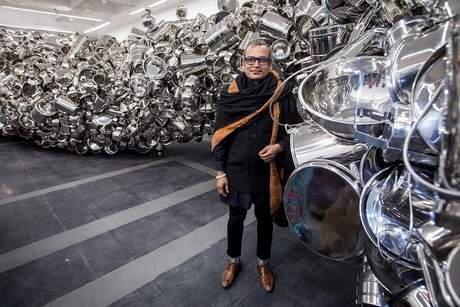 Famously dubbed the “Damien Hirst of New Delhi” by The Guardian, Subodh Gupta is arguably the subcontinent’s most celebrated contemporary artist. The National Gallery of Modern Art (NGMA) in New Delhi opened a retrospective of Subodh Gupta’s works this month, curated by Germano Celant. It is Gupta’s most comprehensive exhibition in India to date and the biggest exhibition the NGMA has ever dedicated to a contemporary Indian artist. The exhibition is spread across two buildings – the ornate Jaipur House, originally built as the residence of the Maharaja of Jaipur in 1936, and the museum’s modern concrete-and-glass extension constructed in 2009. Gupta’s work has been shown in many major international exhibitions including the Tate Triennial in London (2009); Kochi-Muziris Biennale (2012), Kochi, India; The Saatchi Gallery London (2010); and the Guggenheim Museum, New York NY (2010). His works are in the collections of major museums worldwide, among them Centre Georges Pompidou in Paris, the Tate Collection in London, the Astrup Fearnley Museum of Modern Art in Oslo and the Museum of Fine Arts in Houston, Texas. What interests you about the microcosm and why have you focused on that with your solo show, Everything Is Inside? The show came out of my previous sculpture of a black taxi with luggage on top. I had titled it Everything Is Inside. The idea for that piece came at the airline baggage carousels when I observed Indians returning from the Gulf countries where they worked. They had so much luggage that they had packed it all into bundles. You couldn’t even unpack it because it was tied so tightly. I was curious about what was inside. Was it gifts, toys, watches? This show came about based on that piece. What are some of the fresh works that viewers can expect to see at the NGMA? Can you talk about the All in the Same Boat, the new work you’ve created for this exhibition? The Kerala fishing boat in this piece is an object that I used like a canvas. This is an object that has a lot of poetic resonance for many people. You look at the boat and you feel calm and peaceful. I am attracted to objects that contain a lot of meaning, such as boats and vessels. It is interesting to think about what to put on top of that. A lot of your work is about identity. What are some of the themes that interest you? Identity is linked to my journey as an artist. I gain inspiration from the objects that surround me and the ones I see within my own world – plates, food, vessels – simple objects such as those. All these become works that go to Shanghai and other parts of the world. Everything Is Inside had four large works that have never been shown in India. Even for people who have seen my work, these are new installations. Two are outdoor works and two are indoor. The rest have come from Italy, England, Korea and other countries. There are many new pieces that have never been exhibited in this country. We spent days installing it. Why is this show significant? First of all, this is my first solo show at the NGMA. That is important to me because this is my country. This is my home. It is a proud moment for me because the NGMA is a great museum that I have grown up visiting. To be part of it is one of the most important things for me. What do you think about the contemporary art scene in India? We need more art schools. We need more space to show art. We need more art lovers and collectors. I was asking someone, why is it that in India we don’t have 100 new artists every year? Where are all the young artists? Museums should exhibit contemporary artists as well. When people see artists like me, there will be lots of questions, lots of curiosity. That is something we lack in this country. I have a show at a museum in Frankfurt in the autumn. I am also part of many group shows this year, including one at Venice.